Ben: [on phone] Michelle, please don't hang up. Just talk to me, okay? I can't believe you just left. Q: Is the film handheld like the first? Q: What is '10 Cloverfield Lane' about? Q: What exactly was the deal with Howard and his bunker? Much better than the 2008 "Cloverfield" movie, this is about a gripping & intense story and raw tension rather than special effects and crushing things. 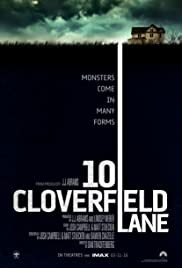 If this is going to be an anthology or if this is going to be followed by that rumored third installment that has been recently spoiled by J.J. Abrahms, I can say that nobody doubts about the secretly marketed "10 Cloverfield Lane" is a great movie on its own. And a movie that if it were spoiled by someone here or at any review would be cruel. Since the start it reveals to be a movie that doesn't hide an ace, but a hundred. The pace can be a little slow at the first half only to add more and more tension, hooking the audience and introducing them into the movie like they were one of the people inside that bunker. John Goodman will be a real trend the future days thanking its superb performance. He's so twisty, complex developed character. He and Mary Elisabeth Winstead make the movie shine alongside the story. The story is so little, then so game-changer, with twists and turns that are smart rather than empty. It's one of that makes you guess all the time. The ending is more of a bang than a whimper. Even when it succumbs to the action and polemic moves, it will leave you on a grim and high note, pestering for another outing if it's any good like this. If the "Cloverfield" that started it all was about speaking without breath and CGI scares, this "10 Cloverfield Lane" is about deeper intentions, deeper tension and personal stuff that is scarier than a giant monster. While the connection to that movie is not so remarkable until the finale, this installment is so brilliant on its own, so well marketed (without ruining any twist) and so well ended that will surely please any viewer who were looking for a damn good movie. This is a scary movie like the classic ones. Don't miss it. 203 of 345 people found this review helpful. Was this review helpful to you?